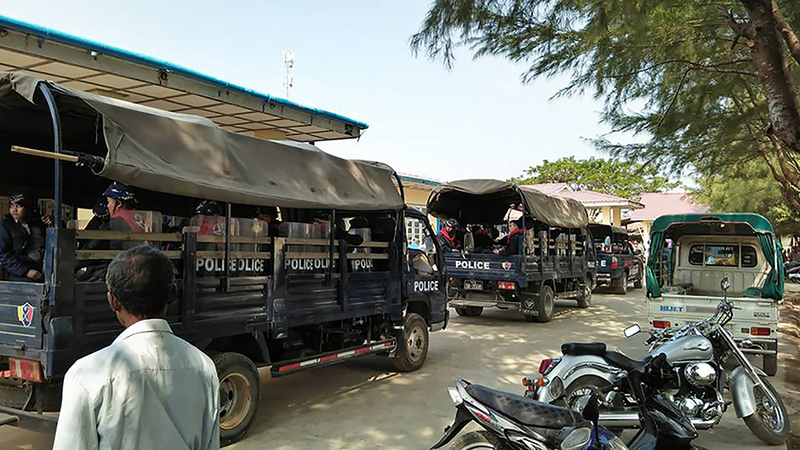 Myanmar police sit in trucks in Rakhine state's Mrauk U township a day after security forces opened fire on a crowd trying to seize a government office, Jan. 17, 2018. Authorities in western Myanmar’s Rakhine state arrested a local lawmaker Thursday and plan to charge him and the organizers of a nationalist ethnic Rakhine event with treason, according to officials, after clashes with police left at least seven people dead. On Tuesday, police shot dead at least seven ethnic Rakhine protesters and wounded 13 others after thousands of members of the minority group marking a Buddhist anniversary converged on a local government building in the town of Mrauk U when authorities attempted to stop the event. Later on Tuesday, police arrested Rakhine social critic Wai Hin Aung in the Rakhine capital Sittwe after he delivered a speech along with Rakhine nationalist lawmaker Aye Maung calling for revolt against Myanmar’s ethnic majority Bamar-led government in Rathedaung township and charged him under Article 17(1) of the Unlawful Associations Act. On Thursday, police arrested Aye Maung and also charged him under Article 17(1). Aye Maung’s friend Aung Than Wai told RFA’s Myanmar Service that police took the lawmaker into custody at his home in Sittwe, where he had been waiting for them on Thursday after learning that a warrant had been issued for his arrest. “Neither the township administrator, district administrator or the [ranking] police officer knew the reason of his arrest,” he said. Later on Thursday, Rakhine state government secretary Tin Maung Swe told reporters that Aye Maung and Wai Hin Aung, and organizers of the anniversary event—who did not receive permission to hold it—will face additional charges of “high treason” under Section 122 of Myanmar’s Penal Code and could be sentenced to death if found guilty. “We received an order to charge the event leader San Hla Baw and other organizers in Mrauk U under Section 122,” he said. Tin Maung Swe also rejected media reports citing sources who said police had used excessive force in firing on the crowd that had tried to destroy property at the township’s government office. “The media has said the police cracked down on the protesters, and that is wrong,” he said. In an interview on Thursday, Aye Maung told the Irrawaddy online news journal from custody that he had heard he would be charged for treason, and instead called for issues such as freedom of expression and the fundamental rights of citizens to be discussed in parliament, to address public concerns. “I would not have been a lawmaker if I wanted to rebel against the government,” he told the Irrawaddy. Nyan Win, spokesman for Myanmar’s ruling National League for Democracy (NLD), said his party “wasn’t at all involved in Aye Maung’s arrest,” when asked about it Thursday. Ethnic Rakhine lawmakers condemned the shooting, noting that residents had peacefully celebrated the anniversary for six years without requiring permission from the local government. Arakan National Party (ANP) Lower House MP Pe Than, of Myaybon township, said he was saddened to see such an incident occur under the NLD’s democratic government. “This incident occurred because of the restrictions on holding a gathering, and the ethnic Rakhines will never forget it,” he said. “We don’t want to suggest that the government did it intentionally, but it should have had a plan in place to avoid this kind of problem,” he said. Also on Thursday, New York-based Human Rights Watch issued a statement slamming authorities in Rakhine for their handling of Tuesday’s protest. “The reported killings of Rakhine protestors by security forces in Rakhine’s Mrauk-U are the latest in a long history of assaults on protesters and freedom of expression in [Myanmar],” said Phil Robertson, Human Rights Watch’s deputy Asia director. “The reported throwing of bricks by protesters in no way justifies this excessive use of force and the blatant disregard for the right to life,” he said. Robertson urged Myanmar’s government to “immediately, independently and impartially investigate this incident” and hold those responsible to account. “But given its track record, this is unlikely to happen, so the United Nations should be invited to investigate,” he added. On Wednesday, London-based rights group Amnesty International, which said at least eight people had died in the incident, condemned the police shooting in Mrauk U as “yet another example of Myanmar security forces’ contempt for human life” and also urged authorities to launch an investigation. Reported by Min Thein Aung, Waiyan Moe Myint, Khin Khin Ei, Thin Thiri, and Tin Aung Khine for RFA’s Myanmar Service. Translated by Khet Mar. Written in English by Joshua Lipes.